I'm no fan of demonizing BF, but I am a big fan of promoting BF in all the colorful ways she/he is seen in our culture. On March 4th MSNBC.com reprinted a newswire press release announcing the debut of the third installation of the Sasquatch Encounters series. You can read the official press release here or continue reading below. LOS ANGELES, CA - Clint Romag, author of the Bigfoot horror series The Sasquatch Encounters, releases the next chapter "Fury Of The Sasquatch." Chad Gamin and Andrew Bridgeton travel to Hyder, Alaska to investigate a flurry of Bigfoot sightings. Little do they know, that the dozens of Sasquatch that slaughtered 30 hunters at Camp Elizabeth four years before are about to reappear. These murderous beasts have remained hidden until now despite massive search efforts throughout Canada. In the middle of the night, the Sasquatch will invade Hyder and unleash a fury that the world has not seen. Caught by surprise, both Andrew and Chad as well as the townspeople of Hyder, will have to fight for their lives against the onslaught in hopes of surviving. The unlucky ones will be dragged deep into caves where even a worse fate awaits them. Also included is the short story "The Grandfather." Whatever happened to the few surviving Sasquatch that escaped at the end of The Ape Cave Horror? Deanna and Rachel, sisters living in Cougar, Washington, are about to find out. A relaxing evening watching television quickly turns into a nightmare. "This is book three in the series and is the most intense story yet," Clint Romag said. "From the first chapter until the end, the reader will be in for a frightful ride. For the first time, you will be getting into the mind of one of the Sasquatch. Also, what is driving this fury? The reader will discover that there may be a darker force directing this attack." "Also included are two maps and several illustrations all created by Jahrome Youngker," Romag said. "It's his best work yet. If the cover doesn't keep you up late at night, the inside illustrations will." Clint Romag grew up in Longview, WA, where stories of Bigfoot roaming the forests outside his small town influenced the direction of his writing. He graduated from Western Washington University, and currently lives in Los Angeles. Romag has written several novels including "The Werewolf King" and "The Ape Cave Horror." Note to Editors: The Author is available for interviews. Review copies of "Fury Of The Sasquatch" are available upon request. 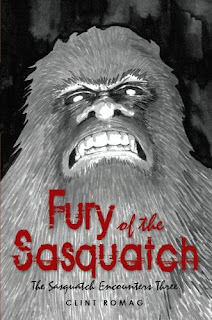 "Fury Of The Sasquatch" is available at www.amazon.com, www.barnesandnoble.com and at Barnes & Noble for $12.95.